Blake In Our Time, an exhibition and symposium, explores the development of Blake’s art, and the continuing interest in his work, as well as the legacy of G.E. Bentley Jr and the growth of the Bentley Collection at Victoria University Library. The exhibition presents examples of Blake’s commercial engravings, and of original works, as well as facsimiles and reproductions of his designs. As Blake’s reputation has continued to grow, so have the many reproductions of his art. In the last years of his life, he lived in great poverty and obscurity, but he continued to develop his art, to produce magnificent work, and to enjoy deep and lasting friendships and ongoing professional relationships with many of his fellow artists, including designer, book illustrator and Royal Academician Thomas Stothard (1755-1834), designer, engraver, and Sculptor John Flaxman (1755-1826), and the visual artist, geologist, novelist, and poet George Cumberland (1754-1848). Works by both Stothard and Cumberland share some of the exhibition cabinet and wall spaces with other of Blake’s contemporaries, giving us a sense of the vibrant cultural context in which Blake worked. The Bentley Collection was given to Victoria University Library in 2005. It consists of manuscripts, and commercial engravings, scholarship and criticism, original Blake materials, as well as a large collection of George Cumberland’s printed works, drawings and manuscripts. They all are part of more than a half century of G.E. Bentley Jr’s scholarly collecting, which itself has been the source for his many bibliographic,a biographical and chalcographic publications. 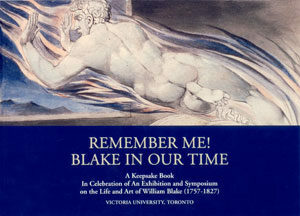 In late 2006, the Victoria University Library mounted an exhibition selected from the Bentley Collection, William Blake & His Contemporaries. This new exhibition, Blake In Our Time celebrates the legacy and continued growth of the Bentley Collection. On display are many of the library’s recent acquisitions, but particular focus has been placed on the ways in which William Blake has continued to be reframed and re-examined in reproductions over the past two hundred years. Featured in the exhibition are manuscripts, electrotypes from Blake’s original copper plates, variations in his illuminated books, and variant reproductions of his prophetic works, as well as twentieth century reprints from Blake’s original copperplates of his illustrations to Dante’s Divine Comedy. Examples of Blake’s commercial engravings span his entire career from the 1780s to 1827, the year of his death. The exhibition also displays Blake’s original black and white engravings of Illustrations of The Book of Jobnext to samples from three different sets of twentieth century reproductions of coloured versions of these original black and white engravings. There are now more than three thousand items in the Blake collection at Victoria University Library. Blake In Our Time: The Exhibition presents its diversity and richness and provides a window into Blake’s world both as commercial engraver and imaginative artist. William Blake came of age during an exciting and optimistic period in English art and publishing. William Wordsworth’s evocative words, “Bliss was in it in that dawn to be alive” (The Prelude, 1805), might almost retrospectively be applied to the optimism for the visual arts in the period of Blake’s youth. Yet by the time Blake reached his forties a financial crisis, political oppression, revolution and war had changed the cultural environment and destroyed many of the opportunities for employment which had seemed to be proffered to young artists of his generation. Beginning his training in drawing under Henry Pars, and in engraving under james Basire, Blake entered the Royal Academy in Somerset House on the Strand as a student in July 1779. It was here that he met George Cumberland, and Thomas Stothard, among many others. Founded in 1768 to promote a national school of art in Britain, the Royal Academy held exhibitions, trained artists, and encouraged debate, in part through public lectures. Its foundation was part of an upsurge in British nationalism, as also evidenced by the creation of the British Museum in 1759. At the same time, of course, the English were becoming a nation of gardeners, as exotic plants were introduced into England from all over the world. Along with a desire to develop a school of British artists came an interest in publishing not only British authors, but also illustrations by English designers and engravers. Over a fifty year period, a matrix of creativity, politics and industrialization ensued and it is difficult to unravel the overlapping strands. Under the Whatmans, father and son, British paper making made enormous strides. ]ames Whatman senior had invented wove paper in response to a demand by the English printer ]ohn Baskerville (1706-1775) who had asked for a smooth surfaced paper on which to print his fine serif type. Additionally, the war of the Austrian succession (1740-1748) had impeded the flow into England of Continental paper imports necessitating an increase in British paper manufacture. The Whatmans’ development of fine artist papers in turn led to a growth in British water colouring. Training in commercial engraving was on the rise, as the Industrial Revolution took hold, and Josiah Wedgwood (1730-1795) industrialized the manufacture of pottery, hiring many British artist to create designs for his pottery and for his sale catalogues, including Thomas Stothard, ]ohn Flaxman, and William Blake. At the same time there was a surge of interest in public monuments, offering employment for British sculptors. In 1786, The Boydell Shakespeare Gallery was initiated in an effort to foster a school of British history painting. Thomas Macklin began his Gallery of the Poets in 1787, for which he planned to commission 100 paintings illustrating famous English poems, which he would publish monthly as engravings from 1790 to 1795. Macklin also undertook to publish an illustrated folio Bible in multiple volumes to promote “the glory of the English school” of painting and engraving and “the interest in our holy religion.” Around this time, Henry Fuseli painted a number of pieces for Boydell’s Shakespeare Gallery before exhibiting a series of paintings from subjects furnished by the works of John Milton, with a view to forming a Milton Gallery akin to Boydell’s Shakespeare Gallery. These grand plans all proved to be commercial failures, but they were widely influential in the fostering of a British School of Art.